A Muscovite who recently visited the peninsula shares his impressions of the region that is in a state of transition. “Why don’t we go for a week to Crimea, to catch some sun,” I ask my wife. 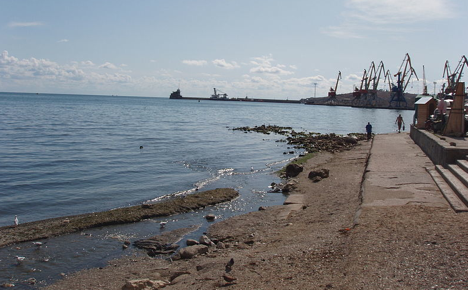 We decide to drive to Kerch and then take a ferry to Crimea instead of wasting time on the border and travelling through Ukraine's southeast, where the situation remains tense. Already on the way, we call our friends who left for the same holiday home in Feodosiya slightly ahead of us. “We spent six hours in the queue to the ferry,” they warn us. Some six kilometers from the ferry embarkation point, I switch off the engine, for as far as my eyes can see, there are rows of cars. On the side of the road, there are makeshift toilets, rubbish containers and a bit further on I can see a tent selling water. The time is 17.25. After a while, people in the queue start talking to each other: there are no complaints or panic, they are just discussing everyday matters. Women are not wasting any time either: some have already changed and are sunbathing under the evening sun and others are playing with children, while one lady is walking her dog. It is getting dark, tourists return to their cars, some are taking a nap. The road is poorly lit, so the only thing that does not let one go to sleep properly is the need to move several metres ahead every 30 or so minutes. The time is 00.30. Everything is quiet. Even the two policemen who are guarding us are no longer chatting with each other. By the middle of the night, I decide to not check my watch any more. Finally, after a desperate leap forward, we are at the port. We pass the road barrier, get a piece of paper certifying the length of our car. After a quick security check, we take a place in the 11th row for embarkation. While my wife is sleeping, along with other drivers, I go the port terminal to get the tickets. Despite the late hour, there are long queues at the four ticket offices that are open. Having bought the tickets, I return to the car to get some sleep. The next thing I remember is a port official knocking on the window to tell us that it is time to move. Some 20 minutes later we enter the Port Krym Bay. After more than 11 hours of waiting for the ferry, my attention is not so acute but I see that there are neither police nor military personnel meeting us in Crimea. A port official behind a window sees that we have a ticket and waves us through so that we do not detain the others. After the queue for the ferry, I was under the impression that Crimea will be packed with tourists. Not so. The farther we drive, the more vacancies signs we see. Officially, the season opens only on June 15, which may be the reason why there are fewer people in the streets of Feodosiya than usual. At the Aivazovsky museum, a young man standing in front of an 1887 painting called Volga asks the museum attendant how come the ship depicted in the picture has a Russian tricolour on its mast. This may be just ordinary ignorance or it may be that not everybody has yet fully comprehended what happened and why.